InvisibleShoe has been kind enough to give both Derek and I a pair of their new 4mm Connect and 6mm Contact huaraches to test and review. This is extra fun because we have never owned the same footwear and this is the first time we can compare our opinions. Derek is interested because he already owns the 4mm Vibram Cherry Invisible Shoes huaraches and has absolutely fallen in love with them. I don't think I have caught Derek saying anything negative about them, but I am not sold on huaraches yet. It will be interesting to see how our views differ from each other and how differently we approach running in the huaraches. Derek lives in the mountains in the eastern United States, and I live in a colder and mostly rainy country (The Netherlands). Sandals are worn here on vacation when you go camping in a country like France or Italy. They are worn when the sun is shining all day and the lovely warm sand is slightly too hot and you have a cold beer in your hand enjoying the sunset. That is when I am accustomed to people wearing sandals/flip flops/huaraches/thongs. So yes, I am a little bit skeptical of the huaraches, but Invisible Shoes has offered me these to test so I will attempt to do so with an open mind. I will be testing both models from my point of view alone which is very different from Derek’s point of view. He already loves the huaraches and he will post his impressions later. Below is a collection of my observations and ramblings about these sandals and really just my experiences figuring out if they are any good. I have been testing both models for about five days straight, walking in them during the day and doing a short run each evening. I don't like the string between my toes for one simple reason, I have eczema and it’s all very manageable until you scratch certain areas. The area between my toes is one of such areas, so the first problem was finding a way to avoid that. I went to the very helpful Invisible Shoe website and found a youtube video, done by Kelly, explaining a method to eliminate the toe string. This video was made for the old huaraches but the same tying techniques can be used. You can find many more tying techniques on the Invisible Shoe site with youtube vids and I urge you to read their forums when you start because the people are very helpful over there. To make the holes I needed, I used a drill with a 4 mm bit designed for wood and just gently drilled the holes (which worked marvelously). I did ruin one hole because I was using a small flat screwdriver to push the rope through and I accidentally put force on the sole itself which created a tear in the rubber. This tear seemed to get worse pretty fast so I made a new clean hole slightly lower than the original, which turned out to be a lot more comfortable. I am not cutting any of the ropes for now, so in all the pictures you'll see lots of extra rope tied somewhere around my foot. 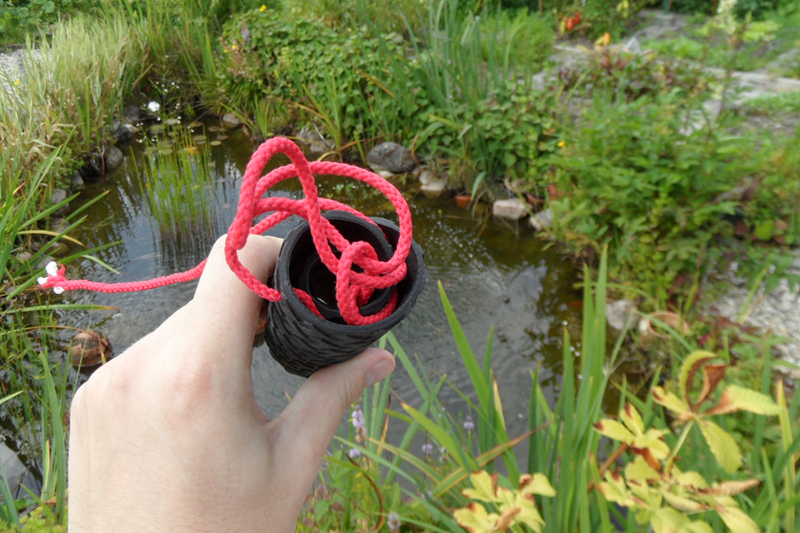 I would advise not cutting the rope, at least at the beginning. 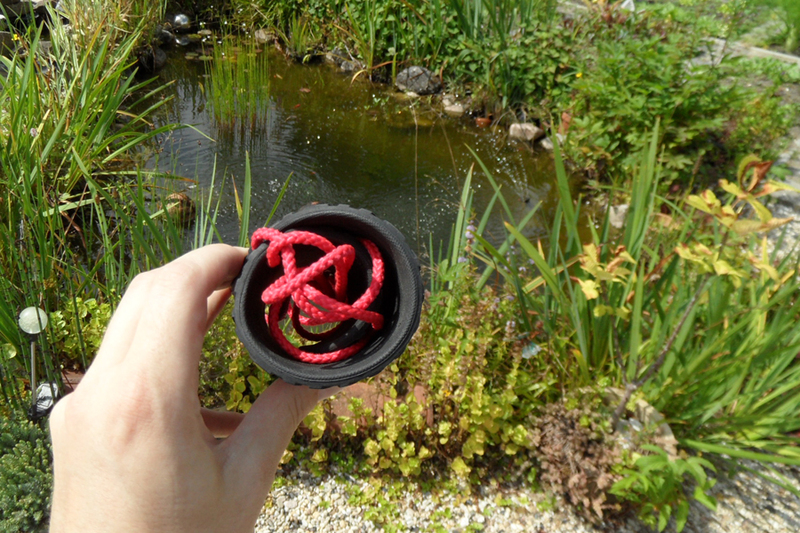 It’s well worth it to try several different tying methods before you settle for one single method. I ran around half a mile (note I am not a great barefoot runner yet so I can’t do long distances) and I was really surprised. I wasn’t really sure what to expect from these sandals because sandals are simply an unknown for me. They felt very good for the 800 meter run that I did and they didn’t slide at all which I thought they would because of the way I tied them. After a few hundred meters my heel dug into the rope and stayed put for the short distance that I ran. I did notice one issue while running in them and that’s the front bit being very loose and flopping around, I accidentally folded it while running on grass. Also, going upstairs I just keep folding them because they are so darn flexible (which is a good thing). I am pretty sure that if you tie them the original way you might not have these issues at all. I am just making things hard on myself by avoiding the string at the toe. It didn’t sit well with me to have floppy, folding shoes so I decided to attempt to fix it. You may laugh at my solution since it looks quite weird, but it does work. I decided not to cut away the excess rubber because when I walk my feet are more forward on the rubber, and when I run they are more in the back of the sole. I don’t know why that is, but I noticed it so I don’t want to cut anything away. I put a small hole in the top and just made a knot there, its just enough to prevent the top from folding under your feet. My second run, with the adjustments that I have made, went much better and the sole never folded back like it did in the first run. It didn't even fold in the grass where it’s a lot easier to happen, but I am not sure if this is the best way to tie the sandals because the rope did dig into my skin and left some nice rope marks. I am curious how my feet will look when I do longer runs in them. I am wondering if they will cause blisters. I ran past a lady with a surprised look on her face after looking at my feet. She said “Hey! 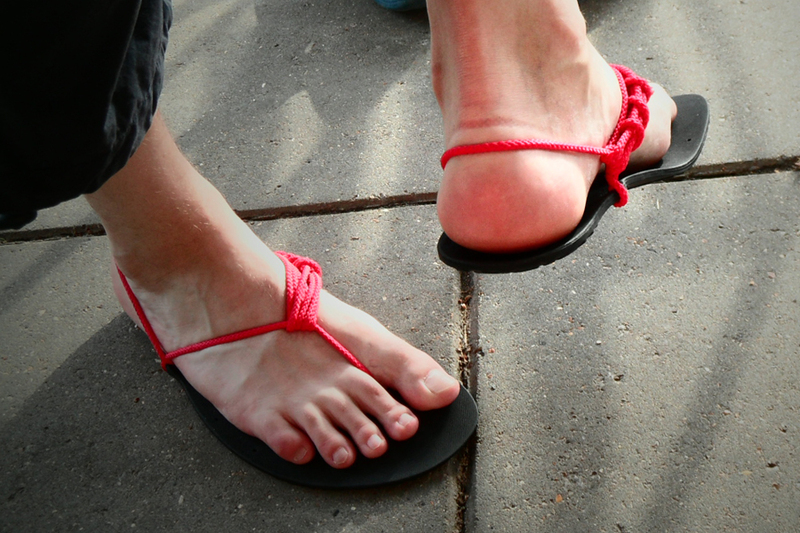 Sandals!”. She was trying to tell me that I was wearing sandals, as if she somehow thought that I hadn't noticed that yet. She said it with a lovely smile so I smiled back and said “I know!”. I guess the sound attracted her to my feet, they do make a distinctive odd sound when you land, but that might be my inexperience with barefoot running. I have to say though, I ran on these much like I would with normal shoes. I did avoid the shellfish pathways and opted to run on the grass, but otherwise I ran exactly like I would with shoes. I did come across some branches and pebbles and such but my feet and the sandals handled that easily. The whole experience of running on these was quite good actually and I had fun making them. 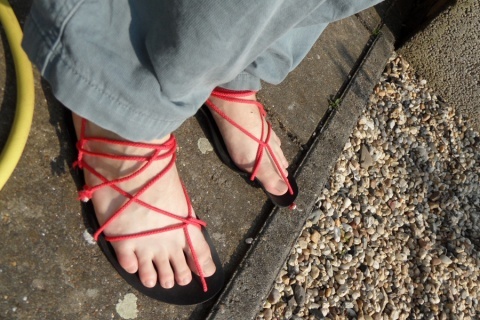 I built the 6 mm sandals pretty much the traditional way as explained on the Invisible Shoes website. I know I said before that I wanted to prevent the toe string for health reasons but I felt that the initial impressions wouldn't be complete if I didn't even bother to try the default way. I certainly encourage people to try all sorts of things like I did. I did a nice short ten minute run and for the first time it was around 26C again, a nice warm temperature with lots of sun. The sun was gone here for a few weeks and running in the Invisible Shoes with the sun shining on them (making the rubber a bit more warm) feels a lot better and more natural. The run felt good and I was able to run without thinking too much about my form which is a very good sign for me. The rubber folded once on the grass, but I don't see that happening on the road to be honest. Now for the bad news. Apparently, I tied them too loose around my heel and I got myself hurt slightly. This might be a good time to tell you that I have extremely soft feet and they are rarely completely bare (except on the beach), so this was to be expected eventually. The rope near my second toe rubbed it raw while running and left a slightly red spot. Today was my last run for now. I ran a little longer than I usually do to properly test the Invisible Shoes and to see if I could manage a little extra distance. I tied them a bit tighter this time to prevent my feet from moving backwards too much which worked perfectly and I felt good about this run. I am not sure if my form is off or my running is terribly shoddy,which might be the case, but they made a very annoying slapping sound if I ran the way I felt was normal. The noise would go away if I really overdid it with landing on my forefoot (which I ended up doing) and now I have sore and stiff calves. I might just need to cut away some of the rubber, but I am hesitant to do that for now. I also ended up with a blister on my foot near my big toe and a sore spot on my heel of my left foot which again might just indicate that my form is simply wrong. I will really need to look into that in the future. I like the 6mm Contact except for the slapping sound on the ground, but again that can probably be fixed. The 4mm Connect has a lot more ground feel and is quite a bit lighter than the 6mm Contact and the Contacts seem to protect your feet a lot better. It still hurts to stand on a pebble or stone but it won’t harm your feet while with the 4mm Connect it might. For walking the 6mm Contact seemed more comfortable because with the 4mm Connect, I had to really watch the ground and pay attention where I walk (which I never do). With the 6mm Contact, you can pretty much walk anywhere without really paying attention all that much. The 6mm Contact is actually thicker than the only other minimal shoe I own, the VIVOBAREFOOT Neo and has less ground feel. Where Invisible Shoe beats the Neo easily is in its flexibility. 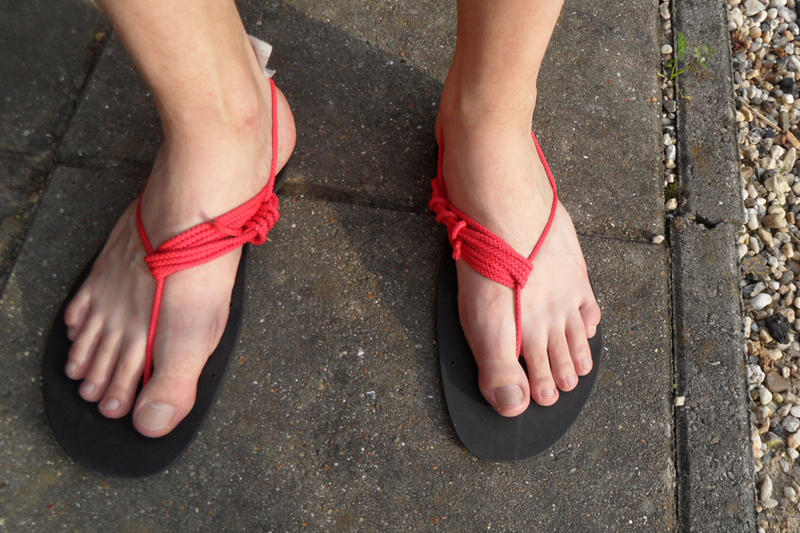 When you bend or push off to run with your feet the fabric of the Neo, or any shoe for that matter, will work against you while that’s simply not possible in the sandals. If you are looking to really approach that barefoot running feel without any compromise, and with just a tiny bit of protection then the Invisible Shoe 4mm Connect would be a great choice as footwear. I personally still prefer the shoes and that’s mostly due to the laces. The invention of laces is really rather amazing, and my feet change shape almost daily now because of all the minimal running. 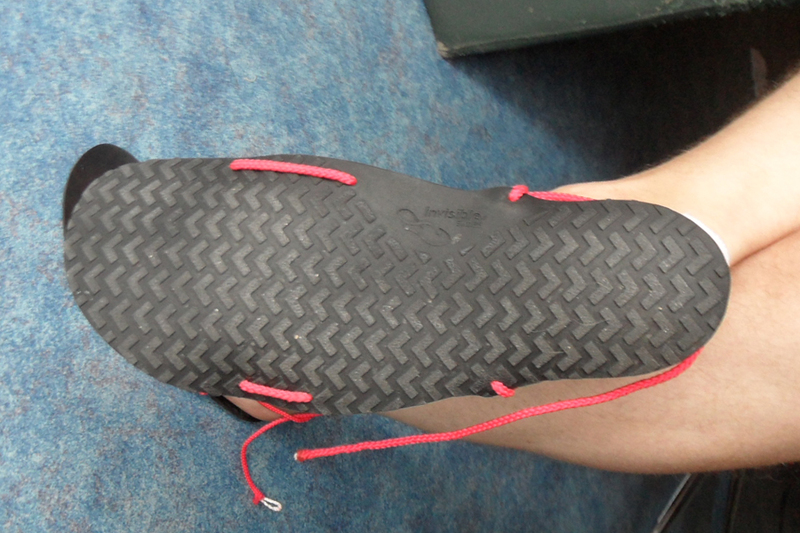 The laces really provide a way to tighten the areas needed and leave the forefoot loose. I wasn’t able to achieve that sense of security in the sandals. 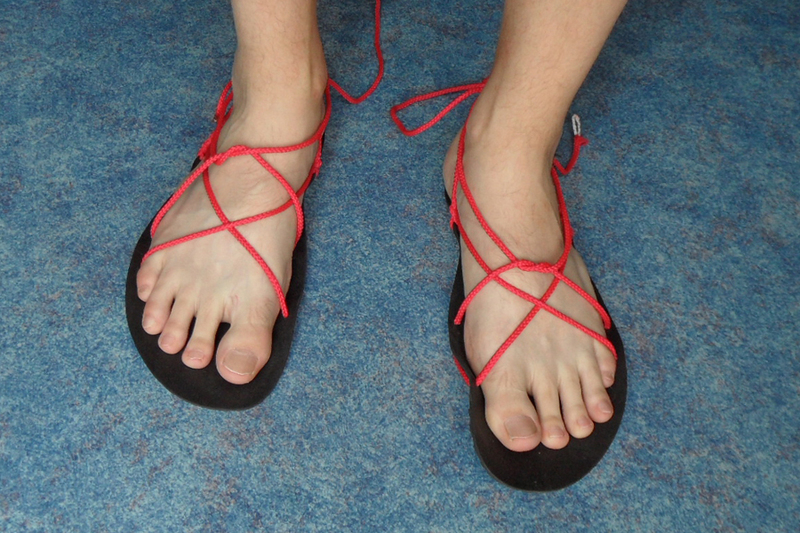 I am a new barefoot runner so I have only been able to do short and gentle runs in the Invisible Shoes. It’s getting better, and I am making progress. The Invisible Shoes feel very minimal and really quite nice and I am starting to understand why so many people love running on them. My feet have toughened up slightly, which is quite surprising in just 5 days. Where the bottom of my feet used to feel like baby skin, they now feel slightly more tough and leathery. I still have that image in my head of people using them on the beach or on holidays, and to be fair, they really are great for that. I still feel awkward running in them and using them for daily wear. With fall around the corner, I only see a few more weeks of experimenting with the Invisible Shoes. Don't despair, I know this impression is perhaps not as positive as people might expect. Derek will post his view in the coming weeks and I already know he is very happy with the 4mm Connects. I am not done with these completely, but I need to experiment more to figure out which way of tying is the best for me. I am very pleasantly surprised, but I am not yet a convert. I am 90% sure I won’t run in these daily but my dislike for sandals has become less and I will definitely try them more often in the coming weeks. I'm Ronald, a student from the Netherlands and site administrator here. I'm relatively new to running and started running simply to get back in shape after an injury forced me to become dormant for a few months in 2010. I'm also interested in minimal running and starting to compete this year.